let’s say that you want to have a look at stock market prices. You launch your app on your phone. The app uses APIs to retrieve data, in our case stock market prices, and display it on the screen. Ten seconds later, those prices have probably changed. You don’t know, but chances are at least some of them have changed. So, you’re going to hit the refresh button to reload. By reloading the page, you’re going to ask again through the same API to get the new prices. With API Streaming you would no longer have to hit the refresh button. You would receive new prices as soon as they are available, the interface would be updated in real-time with no effort required from you, and no frustration to be late on the market. For time-sensitive data, the way APIs work today makes them consume and waste a lot of resources without being accurate in all situations. With API Streaming, we would be able to deliver accurate and fresh data from APIs while reducing their costs significantly. If the goal is attaining the sub-second performance and also, ideally one should reduce the load on the database. The API economy is getting bigger and bigger every day, and lots of companies are taking advantage of it to grow their business. In this economy, streaming is taken more and more seriously as it’s making the whole process more efficient for all stakeholders, whether they are data providers or data consumers. There are two main benefits with this approach. First, by unleashing the power of real-time, our clients manage to increase user’s retention in their apps. Dwell time, the time spent on a page can be much longer compared to static interfaces. You could take advantage of all this extra time! Then, on the financial side, savings and ROI can easily be calculated. On top of providing a real-time feature, we reduce costs by at least 50% (through CPU usage and bandwidth optimizations). How is it different from REST API? 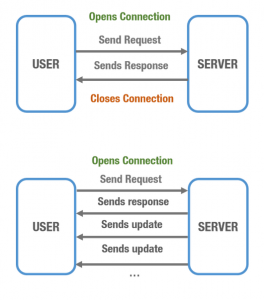 A REST API is a web service that follows a request-response pattern. The user will make an individual request for information from the REST API and receive the appropriate data in a single response. After the response is sent back to the user, the connection closes only to be re-opened when the user makes another request to the API. REST APIs are perfect for users wanting a “snapshot” of data where the information does not change very frequently. Streaming APIs maintain a persistent connection that continuously sends updated data to the user until the connection is terminated. Streaming APIs are perfect when a user needs to consume a constant flow of rapidly updating live data. The server repeatedly sends responses back with updated information until the connection is eventually closed by the user. Thanks for dropping by !! If you have any questions please feel free to drop a comment on this post or you can drop an email to me at naik899@gmail.com.